“Sometimes the Oppressor is a political figure, sometimes a culture or sometimes a friend: and sometimes of course, it is inside of us: our fear, cowardice, expectation and doubt” says a quote from the ‘#Je Suis’ programme. 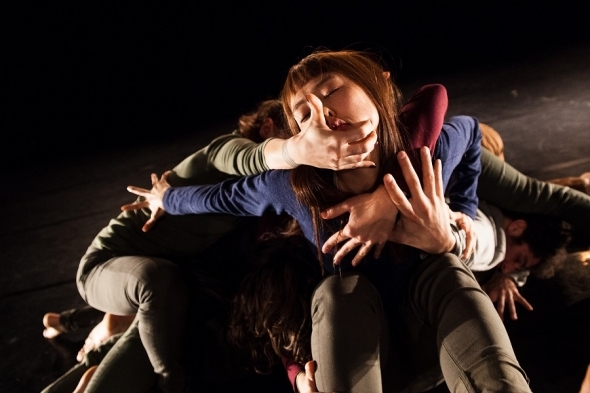 AWARD-WINNING* dance performance ‘#Je Suis’ choreographed by Aakash Odedra held its European premiere at The Patrick Centre in Birmingham last night (February 15). It was an emotionally intense piece which depicted oppression and the struggles faced by many people within the world today. This was highlighted with great effect by using a backdrop and sounds which merged voices and images from the Great Wars with current statements made by some of the World Leaders today, collective voices such as Black Lives Matter, the global movement #MeToo, chants from protesters and campaigners, all enhanced by music from parts of the globe which are undergoing socio-political changes. The dancers were bold, frenzied and energetic. The performances were mesmerising and manic – and yet controlled and fluid. Each sequence was literally lit to great effect, created striking images on the stage, which was sparse and very effective in creating a scene of a dystopian society. It was almost as if steam punk was on the brink of madness. The main male lead, who appeared to be a militant character, offered up a strong performance with subtle signs of showing his own inner conflicts and vulnerabilities. The levels of autonomy showed how the most regimented and fundamental are torn and seem to conform because it provides the individual power and authority. A young female dancer wrapped in cling film created an unsettling, uneasy feeling and a young male character who is seen to be assaulted falls into peals of laughter before his brief moment of joy turns into hysteria and a breakdown, comforted by a blues inspired song. This 60-minute dance piece was haunting, thought provoking and not only explored external pressures, but also how everyone is trying to find their own voices to speak up and even then they are still pulled away and silenced. The stage setting might have been bleak, but the performance was polished, punchy and brutally beautiful in its depiction of oppression, cultural clashes and turmoil. The authentic emotions of the dancers and the story itself provided unequivocal insight as to what it means to be different, other and alienated but also having strength in numbers can provide change, albeit positive or negative. This was a simply stunning piece and one of the best I have seen in a very long time. *Performed as a work in progress and in a shorter format, it won Amnesty International Freedom of Expression of Award at the Edinburgh Fringe Festival last year. ‘#JeSuis’ – behind Aakash Odedra’s first full length work as a choreographer and tackling the forces of darkness. . .